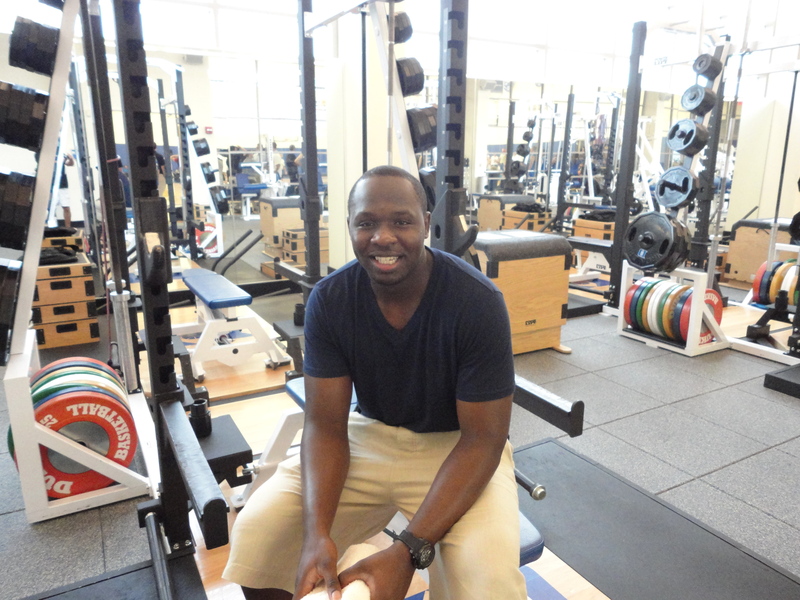 BDN caught up to former Duke quarterback Thaddeus Lewis, who spoke of his young career with the St. Louis Rams, Duke Football, the NFL lockout, Sean Renfree and Duke Hoops. 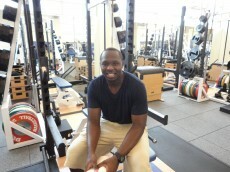 Lewis, who has been working out at Duke, was the back up quarterback for the Rams in his rookie season. 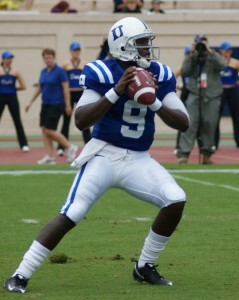 DURHAM, N.C. – Former Duke quarterback Thaddeus Lewis will participate in the annual Pro Football Hall of Fame Texas vs. The Nation Challenge set for 2 p.m. on Saturday, February 6 at Sun Bowl Stadium in El Paso, Texas. 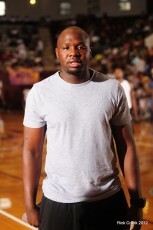 Lewis will play for the Texas squad, coached by Howard Schnellenberger, who guided Miami to the 1983 national championship. Former Dallas Cowboys standout Bill Bates will coach the Nation unit. A native of Opa-Locka, Fla., Lewis closed out an outstanding career with 48 school records including career marks for total offensive yards (9,987), passing yards (10,065), pass completions (877), pass attempts (1,510), touchdown passes (67), 300-yard passing games (11) and touchdown-to-interception ratio (1.68:1). In 2009, he completed 274-of-449 (.610) pass attempts for 3,330 yards with 20 touchdowns and eight interceptions. One of just two quarterbacks in ACC history to throw for over 10,000 yards in a career, Lewis paced the league in passing yards per game (277.5), and his 3,330 passing yards rank as the second-highest single-season total in Duke history. Lewis, who earned second team All-ACC honors in 2008, is Duke's first two-time all-conference quarterback since Ben Bennett captured first squad honors in both 1982 and 1983. Other former ACC players scheduled to play in the game include Brent Bowden (P, Virginia Tech), Derrick Epps (TE, Miami), Toney Baker (RB, N.C. State), Cory Jackson (FB, Maryland), Kyle Jolly (OT, North Carolina), Will Barker (OG, Virginia), E.J. Wilson (DE, North Carolina) and Travis Ivey (DT, Maryland). DURHAM, N.C. – Wake Forest quarterback Riley Skinner threw for 372 yards and five touchdowns as the Demon Deacons defeated the Duke Blue Devils, 45-34, Saturday afternoon in front 21,420 fans at Wallace Wade Stadium. Senior quarterback Thaddeus Lewis turned in a strong performance in his final game, completing 28-of-48 passes for 387 yards and three touchdowns. For his career, Lewis totaled 10,065 passing yards to become the 60th quarterback in NCAA history to reach the 10,000-yard mark for his career, and the eighth this season. Lewis’ 67 career touchdown passes is also the second-highest career total in ACC history. Receiver Donovan Varner finished the day with 11 receptions for 174 yards and two touchdowns. 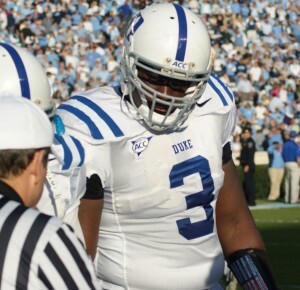 Varner caught 65 passes for 1,047 yards in 2009 to become just the third player in Duke history with over 1,000 yards receiving in a single season. Receivers Conner Vernon and Austin Kelly both collected 93 receiving yards, while tailback Desmond Scott totaled 252 all-purpose yards on the afternoon. Senior linebacker Vincent Rey paced the Blue Devil defense with 11 tackles. Both offenses dominated the first quarter as the two teams combined for 329 total yards and four touchdowns in the opening 7:39. Duke struck first, 1:04 into the first quarter on the third play of the day with a 56-yard touchdown pass from Lewis to Varner. Wake Forest would tie the score less than two minutes later as Skinner hit receiver Devon Brown with a 28-yard pass on the Deacons’ fourth play of the afternoon. The Blue Devils took the lead again, needing only 1:04 and three plays to reach the end zone. This time, Lewis found Kelly breaking through the middle for a 62-yard gain. On Wake Forest’s following possession, the Blue Devil defense forced a punt, but a personal foul penalty gave the Deacons the ball back near midfield. Wake’s offense capitalized on the Duke miscue, knotting the score at 14-all on a 54-yard touchdown pass from Skinner to receiver Chris Givens. The Demon Deacons took the lead for good early in the second quarter, covering 55 yards in eight plays. Skinner tossed his third touchdown pass of the game, again finding Brown for an eight-yard strike. On Duke’s following possession, tailback Jay Hollingsworth rushed for two first downs to push the Devil offense across midfield, but Duke stalled in Wake territory. However, Kicker Will Snyderwine connected on a 51-yard field goal attempt, the longest of his career, and the Blue Devils trailed 21-17 heading into halftime. Yet the third quarter would belong to the Demon Deacons, with Skinner throwing for 154 yards and two touchdowns in the period, including a 13-yard strike to tailback Kevin Harris and a 51-yard pass to receiver Marshall Williams. Duke was able to add a field goal in the third quarter, but trailed 35-20 heading into the fourth. A missed Wake field goal gave the Devils the ball back, and Lewis punched the ball in from the one-yard line to cut Wake’s lead to 35-27 after an 80-yard drive. But the Blue Devils could not narrow the lead any farther and Wake Forest would add a field goal and run back an interception to take a 45-27 lead late in the fourth quarter. Duke added another touchdown, a 21-yard reception by Varner, with 2:31 left in the game, but Wake Forest was able to run out the clock for win. Duke fans have one more chance to see Thaddeus Lewis in a Duke uniform this Saturday against Wake Forest. Lewis talks about his future and his glee in getting a diploma from Duke and much more in this audition interview. BDN salutes Thad and the seniors and we will covering his last game from field level this weekend. Come out and support some great seniors and help cheer Duke to a win and a 6-6 season. Duke (5-6, 3-4 ACC) will host Wake Forest (4-7, 2-5 ACC) on Senior Day this Saturday, Nov. 28. Kickoff is scheduled for 12 noon (ET) at Wallace Wade Stadium. The game will be televised on Raycom Sports with Tim Brant calling the play-by-play, Rick “Doc” Walker providing the color commentary and Mike Hogewood on the sideline. The Blue Devils are coming off a 34-16 loss at No. 20 Miami last weekend while the Demon Deacons had a bye week and lost to Florida State, 41-28, in their last game. Duke led 16-13 heading into the fourth quarter, but Miami scored 21 unanswered points to come away with a 34-16 win at Land Shark Stadium. Thaddeus Lewis broke Duke’s career record for passing yards with his 303-yard performance. His top target was Donovan Varner who caught eight passes for 165 yards and one touchdown. Miami was led by Jacory Harris, who threw for 348 yards and two touchdowns, and Leonard Hankerson, who finished with eight receptions for 143 yards and one touchdown. Duke leads the all-time series between the two schools 53-34-2. The Demon Deacons have won the last nine games in the series. Duke’s last win was a 48-35 win in Durham in 1999. The Demon Deacons came out on top in overtime as Shane Popham made a 28-yard field goal and Alphonso Smith intercepted a Lewis pass in the endzone for a 33-30 victory. Popham finished the day with three made field goals while Riley Skinner threw and ran for a touchdown. 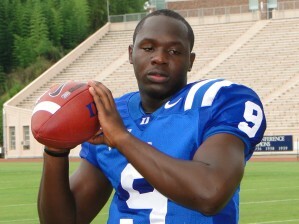 Duke was led by Thaddeus Lewis, who threw two TD tosses to Clifford Harris. 1 - Senior quarterback Thaddeus Lewis will move into a tie for fourth on the ACC career passing touchdowns chart with one more touchdown passes. Lewis currently ranks fifth with 64 career scoring tosses. 2nd - Sophomore wide receiver Donovan Varner ranks second in the ACC for both receptions per game (4.91) and receiving yards per game (79.4). 3 - True freshman Conner Vernon is three catches shy of 50 for the year, which would put him in third place for most receptions by a freshman in ACC history. Vernon also ranks fifth all-time in league history with 653 receiving yards, 42 shy of climbing into third place. 13 - Senior linebacker Vincent Rey is 13 tackles away from his third straight 100-tackle season. He is looking to become just the seventh player in school history with 100 or more tackles in three or more seasons. 15 - Duke will honor 15 players this Saturday on senior day. 15 - Junior walk-on Will Snyderwine has made 15 field goals this season to rank tied for third in school history for a single season. He is 15-of-18 (.833) on the year, which is currently the highest percentage for one season by a Duke kicker. 20 - The Blue Devils have held five opponents under 20 points this season, marking the first time since 1994. 45 - The Blue Devils have tallied 45 plays of 20 or more yards on the season with five plays of over 50 yards. Varner has 16 receptions of 20 or more yards. 48 - Lewis currently holds 48 school records, including 25 career records, 17 single season marks and six single game records. 54 - Varner has 54 catches this season to rank ninth on Duke’s single season receptions list for wide receivers. Varner and junior wide receiver Austin Kelly have become two of the 20 players at Duke with at least 50 catches in one season. 97 - Duke has a Graduate Success Rate score of 97, the highest in the ACC. The football team’s score of 96 was the highest among Football Bowl Subdivision schools with only six programs posting a 90 or better. 100 - Varner has four 100-yard receiving games this year, all in ACC play. His four 100-yard games are tied for fifth most in a single season at Duke. 127 - Varner needs 127 receiving yards to become the fifth player in school history with 1,000 receiving yards in a season. He is currently ranked seventh for a single season with 873 yards. 162 - Lewis needs 162 passing yards to pass Chris Weinke of Florida State for second on the ACC career passing list. Lewis has thrown for a school record 9.678 yards in his career. 297.5 - Duke leads the ACC and ranks 10th nationally in passing offense, averaging 297.5 yards per game. The Blue Devils have thrown for over 300 yards in six games this season. 300 - Lewis has passed for over 300 yards in six of the 11 games this year. His six 300-yard games are the second most in a single season at Duke while his 10 career 300-yard games ties a school record. 700 - With 47 receiving yards Kelly will join Varner with 700 receiving yards on the year, making the duo just the fourth in school history with over 700 yards each. 3,000 - Lewis is 67 passing yards away from becoming the fourth quarterback in school history to throw for 3,000 yards in one season. Ben Bennett accomplished the feat in 1982 and 1983 while Anthony Dilweg has the single season record with 3,824 yards in 1988.